British firm introduces a flat wine bottle that cuts packaging, storage, and shipping costs. The search for more efficient and eco-friendly ways to package and transport liquids has led to such innovations as biodegradable six-pack rings, beer trains, and even auto-stackable bottles that eliminate the need for cardboard cartons. 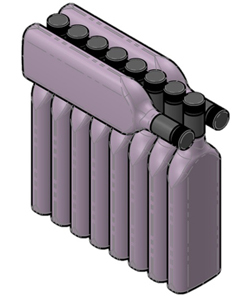 Garçon bottles can be packed with eight flat bottles vertically and two more lying horizontally on top. But until now, no one has figured out how to fit more wine bottles into a case. The answer to that puzzle may come from a British bottle-maker that has invented a flat wine bottle made from durable recycled plastic called polyethylene terephthalate, or PET. London-based Garçon Wines says its "Garçon bottles" conform to the traditional wine-bottle shape but are 40 percent spatially smaller and 87 percent lighter than round glass bottles of the same volume. Viewed from the front, the bottles resemble the classic cylindrical Bordeaux bottle. But the side view reveals that bottles are actually flattened into a kind of flask shape, which allows them to be stacked more densely into rectangular crates than standard bottles. Garçon Wines says it can eliminate almost all of the unused airspace in a typical wine case by packing eight flat bottles vertically, with two more bottles lying horizontally in the open space around their bottlenecks (see illustration). This "10 flat bottle case" is about 55 percent smaller than a typical case built for six round glass bottles, the firm says. Translated to warehouse terms, that means a pallet loaded with the 10-flat-bottle cases can carry 1,040 bottles of wine compared with a standard pallet load of just 456 round glass bottles. And fitting 2.28 times more wine on a pallet translates to lower costs for packaging, storage, warehouse handling, and transportation, the company says. Feedback: What did you think of this article? We'd like to hear from you. DC VELOCITY is committed to accuracy and clarity in the delivery of important and useful logistics and supply chain news and information. If you find anything in DC VELOCITY you feel is inaccurate or warrants further explanation, please ?Subject=Feedback - : Bottle of red wine ... though maybe not the bottle you're expecting">contact Chief Editor David Maloney. All comments are eligible for publication in the letters section of DC VELOCITY magazine. Please include you name and the name of the company or organization your work for.